Since you came here through a link on our web site or as a referral from a friend or colleague, we would like to offer you a complimentary PDF copy. We encourage you to freely share it with others. Risk is not a one-dimensional problem cured by a single dose of diversification. It's a multidimensional problem, and diversification’s passive risk reduction is only just the start. At least since Markowitz developed Modern Portfolio Theory 65 years ago, risk has generally been measured as the standard deviation from average return. However, Behavioral Economics (and even the dictionary) say risk is really about the loss of value. Risk has at least seven unique faces, including (1) Single-Stock Risk, (2) Market Volatility, (3) Bear Market Crash, (4) Momentum Loss, (5) Backtesting Deception, (6) Strategy Hired/Fired Late, and (7) Retirement Savings Will Not Be Enough. The elephant in the room for most people facing retirement is a serious retirement savings shortfall – making their most serious risk about insufficient returns. Fortunately, a Royal Society Fellow, a National Medal of Science winner, and a trio of Nobel Laureates have laid the foundation for active risk reduction and better returns that have forever changed the game. This book intends to shake the very foundation of the sleepy momentum monoculture that seems happily mired in decades-old, simplistic, risk models that not only fail to treat momentum as the multi-faceted problem it is, but also fail to consider fundamental signal processing methods (older than Modern Portfolio Theory) that reduce the “random walk” part of the signal and improve the probability of making a better investment choice. The book’s principles and methods are described in a manner most ordinary investors will easily grasp, and while it is complicated under the hood (like your car), software tools make it easy to drive. So, buckle up, turn the page, and let’s go for a ride! This book starts by identifying “the seven faces of risk” and particularly noting that the well-reported retirement savings shortfall is the biggest of them and cannot be addressed by classic diversification – it’s an investment return problem. The book then segues into the troubling analysis and revelation that our financial regulatory agencies, FINRA and the SEC, provide neither a definition nor a measurement of risk and yet arbitrarily judge the client portfolios of defenseless wealth managers during risk audits. To address these problems, a set of new tools are developed: A measure called “Relative Risk” is developed based on a consensus set of industry-standard definitions that enable risk category portfolios to be modeled, quantified, and used as reference standards in assessing and defending the risk performance of any portfolio; and mathematics from the cross-disciplinary fields of information theory and electronic signal processing (think WiFi, cell phones, and digital TV) is brought to bear on momentum trading resulting in the development of Temporal Portfolio Theory. Temporal Portfolio Theory can be thought of as an extension of Modern Portfolio Theory that provides a means to conquer many of the faces of risk through “risk avoidance,” as opposed to “risk dilution” (a.k.a. diversification). Finally, the book employs these principles and tools in numerous example strategies and portfolios that anyone can personally implement and manage with a few trades per year. The book is richly illustrated with over 300 full-color images and charts. "Conquering the Seven Faces of Risk does a great job outlining a variety of momentum strategies rarely discussed by academic researchers. Scott brings his strong electronic signal processing background to bear on momentum investing in a manner that challenges conventional methods and will surely stir the pot. Be prepared to think outside the box!" — Richard Erkes, Former Chair of the State of Illinois Retirement Board, Former Program Director of the LA AAII Chapter. Scott is a Founder, President, and CEO of SumGrowth Strategies of Seattle; the developer of SectorSurfer (for individuals) and AlphaDroid (for financial advisors). He holds an MSEE from Stanford University, and a BSEE from the University of Wisconsin – Madison, has been granted over 40 U.S. and foreign patents, and is a panel judge for the prestigious NAAIM (National Association of Active Investment Managers) Wagner Award. Scott has over 30 years’ experience in both hands-on and executive-level positions, including former Founder and Engineering VP of IDX Inc., and VP of Advanced Engineering at EATON Corporation’s Opcon division for industrial photoelectric sensors. Scott has spoken to over 50 investment groups in the past 3 years. • "Using Asset Class Rotation to Reduce Risk and Increase Return"
• "Satisfying the Prudent Man: Quantifying and Defending Risk"
hardcover, Marcel Dekker, New York, 1988). 2.) Include a self-addressed, postage-paid padded envelope for return. • The name of the person the autograph is for. • Any information you would like Scott to reference. • Your email address in case of a problem or question. • Why was this book important enough to you to ask for an autograph? • What is your prior investment experience? How does this method compare? • What other comments or suggestions might you have? • What is your walk in life? 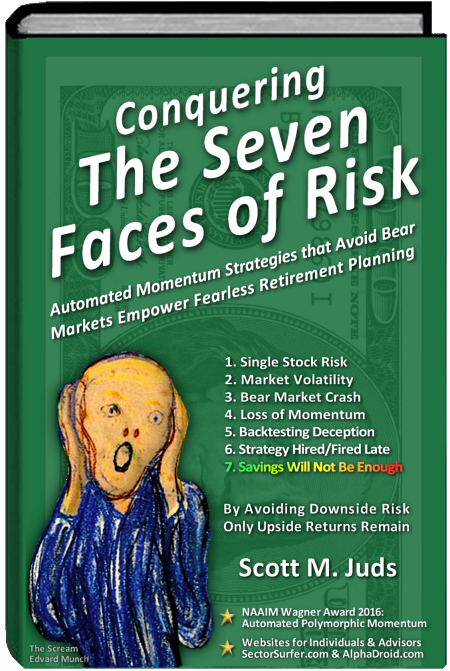 Conquering the Seven Faces of Risk: Automated Momentum Strategies that Avoid Bear Markets Empower Fearless Retirement Planning by Scott Juds is a book that, in a nutshell, gives readers the knowledge and wisdom they require to reduce investment risk and get increased returns. This is a powerful tool for investors, one that explores all the facets of risk and creates a road map that can give confidence to investors while helping them make informed and better choices. Readers are introduced to the different facets of risk, including single stock risk, bear market crash, momentum loss, market volatility, and a lot more. By understanding the nature of risk involved in an investment, the investor can get the tools required to beat the odds and raise the returns on retirement investments. Scott Juds writes with the confidence of one who has done his research properly, a real economist who understands the nature of investment markets, and his wisdom is communicated in a simple, easy-to-understand style that will appeal to ordinary readers. I found most of the ideas in this book very revealing and powerful. In fact, the author gives readers everything they need to make intelligent choices related to investment, from how and where to invest, to understanding the risk involved, and to management risk. This is the book that anyone who is serious about making significant investments should read. 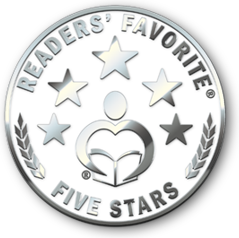 The author’s voice comes out powerfully and convincingly and his strategies are clear and easy to understand. Conquering the Seven Faces of Risk: Automated Momentum Strategies that Avoid Bear Markets Empower Fearless Retirement Planning is your guide to a profitable retirement investment. A must-read! Conquering the Seven Faces of Risk: Automated Momentum Strategies that Avoid Bear Markets Empower Fearless Retirement Planning by Scott Juds is a powerful book for both investors and business owners, a book that brilliantly handles one of the topics that could determine the success or failure of any investment: risk. In this book the author explores the multifaceted nature of risk, outlining the seven unique faces of risk, and how to spot them. The reader will learn a lot, if not everything they need to manage risk and maximize on their investments and business ventures. Combining traditional wisdom in the industry with groundbreaking strategies, the author offers readers the road map to navigating risk and staying on top of their investments. This is the book you need to read before you start making new investments. The book is written in a simple, clear, and very accessible style, without the jargon that confounds readers and, whether you are an ordinary reader or a professional economist, there is a lot to learn from Scott Juds. There is no doubt that the author has done great research on the subject and that he writes from extensive experience. This is evident in the confidence that comes across in the crisp and exciting prose, the compelling and authoritative voice, and the clear examples. The anecdotes and examples offered are very poignant and relevant. Conquering the Seven Faces of Risk is a powerful tool that will alter the way readers think about risk and help them to transform every risk into an opportunity for investment success. Conquering the Seven Faces of Risk: Automated Momentum Strategies that Avoid Bear Markets Empower Fearless Retirement Planning by Scott Juds takes a detailed look at all of the risk factors in investment planning and how to maximize gain using sophisticated tools and techniques. The book starts off with an introduction to Scott himself and his early experiences and lessons dabbling in the stock market. He writes from personal experience that risk in investment strategy is a complex issue and can only be solved by looking at several factors together. The book is then divided into broad sections that identify the seven faces of risk: Single-Stock risk, Market Volatility, Bear Market Crash, Momentum Loss, Backtesting Deception, Strategy Hired/Fired Late, Savings Will Not Be Enough, a look at traditional investment risk management, relative risks, various software tools and monitoring trends, and finally how to conquer this risk by taking all factors into account in an innovative, modern way using modern tools while creating your own 401K portfolio. I found Conquering the Seven Faces of Risk to be an instructive book, although a bit technical at times. Although most of the concepts and language used is straightforward enough for a layperson to understand, I also felt that at times it got a bit technical to the point where I had to research a few terms on my own. This was especially relevant when it came to reading the charts and data, of which there are plenty, and understanding the trends and various statistics. That being said, I think this can be an excellent book for a serious investor and some of the software mentioned in the book that provides results would be extremely useful. I would recommend this book to anyone who is interesting in actively managing their investments. I really like your book. I sent a copy to my friend Mark, We both grew up in the Wedgewood (mean streets) area. He just finished the book, and told me it is the best investment book he has ever read. He subscribed, his sister and dad are looking at SectorSurfer, I have two friends that will join, I will need to help them. The biggest takeaway for me is how much you want to help the small investor. I see it in the way you keep the costs down, and in your writings. I have a huge passion for investing and I think you have created the best platform that I have come across. I am still reading your book and I also think it is the best one I have seen. I am going to spread the word. Thanks Scott!